UP AC45CCTE 7879, running as a light engine northbound, approaches the rear end of a disabled coal train on Union Pacific's Shoreline Subdivision. 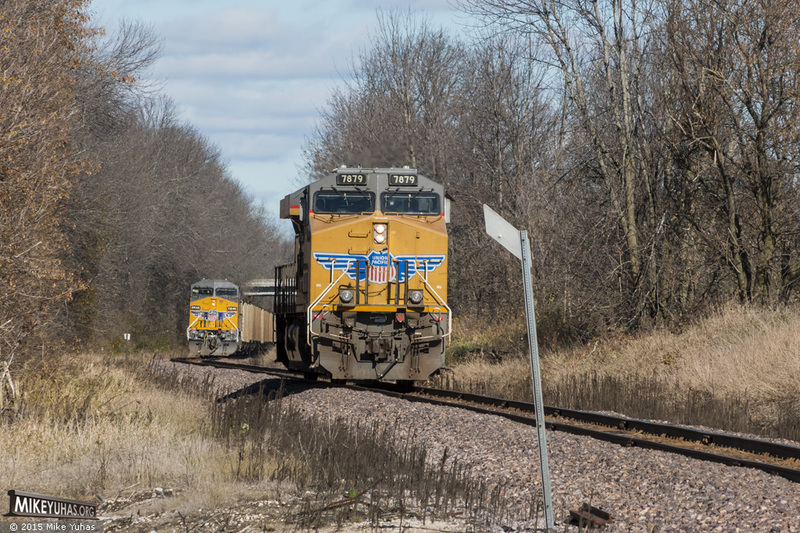 Earlier this morning, the LPA82 crew heading to Sheboygan began experiencing issues with the distributed power unit on the rear of the train. It was finally determined that the DPU, UP 6848, had run out of fuel, which caused the engine to shut down, which caused the DPU's independent brakes to set. Hours after the trouble started, the LPA81 crew was called to bring a light engine up from Butler to rescue the stranded train. In a moment the AC45 will tie on, but it'll take another two hours of troubleshooting before the train is once again underway toward Sheboygan.